Have a look at what some of our clients have had to say about our services for the GC license in Florida. The testimonials here prove that you can achieve real results with our general or associate general contractors testing materials and programs. Regardless of whether you are planning to become a licensed general contractor or you need to take a test for a specified trade, such as a roof contractor’s exam, we can provide you with everything you will need to pass your contractors license test with flying colors. 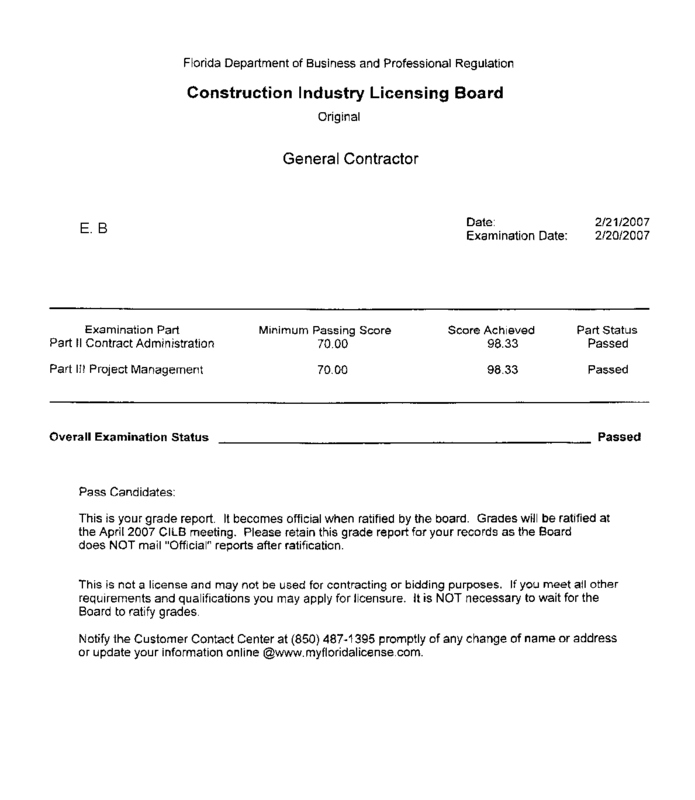 I wanted to send you a quick note to tell you that I passed the General Contractors Exam. (94, 83, and 88) I followed Nacho's plan and studied hard and was another success story to add to your long list. I truly can say that I could not have passed the rest without your wisdom and guidance. From the testing strategy, to the tabs, to the highlighted book, to the math shortcuts, to the practice tests, to your continued push to get together after class for study groups, you are the real deal. I had no idea how well prepared I was. I would recommend you and your class to anyone. It was hard work but well worth it! I passed with a 99, 98 & 96. Your class had me so well prepared! I can't thank you and your daughter enough. I thougth the contract admin was a lot harder than I expected, and the project mgmt. was easier than expected. Overall the preparation you provided was excellent. I knew what to expect. Thank you again for your superb preparation. Thank you for providing a great class in preparing for the Florida Contracting exam. While waiting for the exam to begin I spoke to many people around me relying on their years of experience and knowledge to pass the exam. While walking out early after finishing my exam and checking my answers I saw those same people flipping through books still searching for answers. Even though I don't have near the experience these other people have, I passed with these scores: Part 1 - 90.00, Part 2 - 88.00, Part 3 - 94.00. I don't think their day ended with the great feeling mine did. terms of length and breadth of material. I would not have done so well without your prep course. Josh P. West Palm Beach Fl. "Thanks Guys, without your help I would have never passed. The extra time you spent with me really paid off!!!" "The prep course for the Florida GC exam was fantastic. Thanks to the staff at Contractors Exam Prep, Inc., I scored a 98.33 on both parts II and III on my first attempt. The instructors were knowledgeable, patient, and enthusiastic. Take this course, and you'll cover almost all of the materials you'll see come test day. I just wanted to let you and Nacho know that I passed all three parts of the General Contractors Exam with scores of 96.25, 98.33 and 93.33. I would like to thank both of you for the service you provide. I can't imagine taking the exam without attending your class. The preparation was invaluable. I would like to thank FLORIDA CONTRACTORS TEST PREP for providing such a great course on how to pass the Fl CGC exam. I passed my first time with and avg score of 89. I appriciate all your help. There is absolutely no way that I could have passed without the class. The highlighting and tabbing of the books was invaluable and well worth the money. The instruction was well paced and informative. Nacho and Aly obviously both know their stuff and were great teachers. I just wanted to thank you both. I can't imagine attempting this test without the help of a professional classroom. You both do an excellent job teaching what is needed ton know to pass. I passed the exam 85, 88.3 and a 78.3. The funny thing was that I felt as if the 2nd day morning session was harder than the PM session. I know I guessed on at least 10 questions on the PM session because I could not find the look-ups (too tired I guess), but no matter a 78 is still passing. Thanks for the effort you and your daughter take to prepare us for the test. I just wanted to drop you a line and give you the results of my August test. I passed all three w scores of 97.50, 90.00 & 88.33 on parts I, II and III respectively. I was extremely pleased especially when you consider that I did not open my books until I started your class. Obviously you guys did a great job prepping us for the exams. Thanks for the help and I would be glad to refer others to your class when the opportunity presents. Thanks for all your help. I passed all three parts of the test last week with a 93, 98 and 98. The information that you provided during the seminar was right on. The tip of reading all the questions first before answering any and then answering questions by book really saved a lot of time and allowed extra time for those hide and seek questions. It was also amazing how the answers to other questions popped out as I looked through the book for a single answer. The tabs and highlighting were excellent and the sample tests had us well prepared for the actual tests.